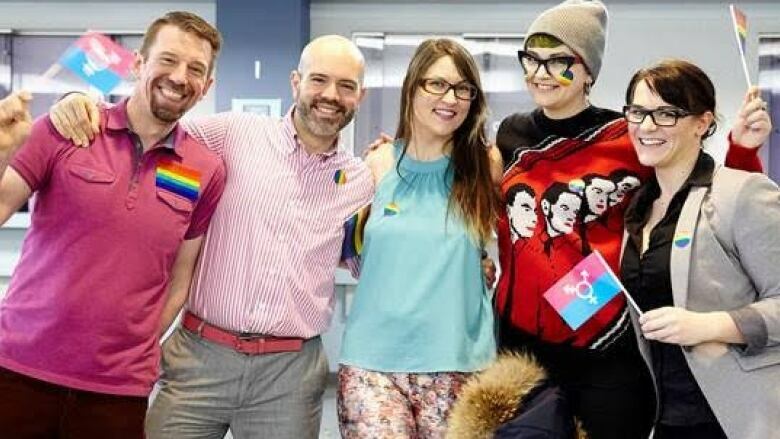 Pride week at the Northern Alberta Institute of Technology begins Monday with a walk and rally on campus, where attendees will wave flags and placards, play music and dance. Part of the motivation behind the third annual pride week is to encourage students, LGBTQ and others, to be themselves, said Tim Ira, co-ordinator of student well-being and community and organizer of the week's events. "The conversation wasn't happening," Ira said. "We often times felt that students may not have been living as openly as possible, or as authentically, and we wanted to let them know that this is a campus where you can do that." Ira said there has been some opposition to pride week. Some alumni he has heard from think staff and students at NAIT should focus on technology and education and not concern themselves with the social aspects of campus life. But Ira said it's important to counter the habitual practice of using language about unconventional sexual orientation in negative ways. "A lot of homophobic language, like calling things 'gay,' calling each other 'fags,' when what they really need to be saying is they think something is either unacceptable or something is stupid." The pride events aren't exclusively for lesbian, gay, bisexual, transgender and queer students. "This is a movement that wants to make people, as individuals first and foremost, feel really celebrated, feel like they can be themselves. And actually empower those individuals to live their best life possible." Pride week includes a Richard Simmons aerobic class and a clothing swap, Ira said. "You can be yourself with your classmates, with your instructors. You can feel really comfortable and pride week is just a way to kind of reinforcing that."